Drop into the school room this Easter Holidays to join us for a lively colourful Naturemake workshop. 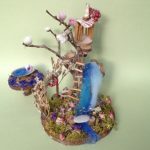 Choose from our spring inspired natural treasures to create enchanting miniature gardens, delightful animal families or magical fairy houses. As always, lots of fun and suitable for all ages including grown up makers. Cost: £4 to £12 depending on chosen model/size. Please note: Unfortunately, card payment facilities are not available for this event/venue.